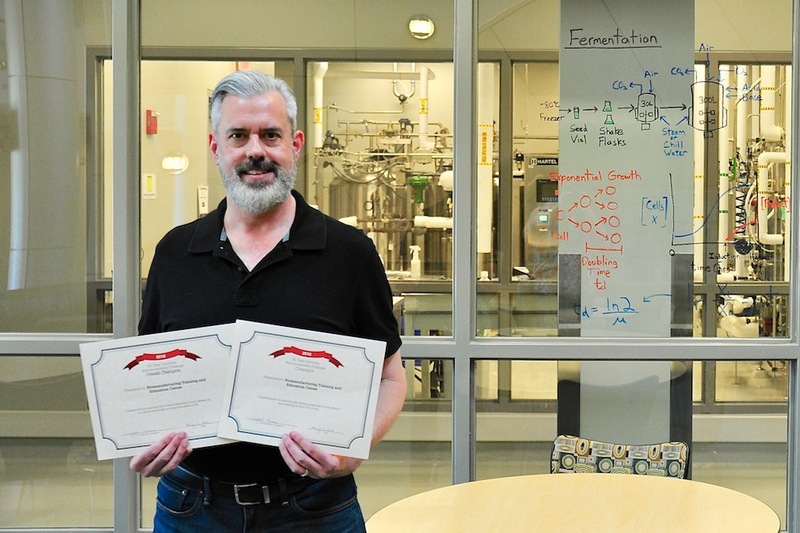 Brian Herring, BTEC's instructional media developer, has received awards for Overall Champion and Category 2 (errors of 10% or less) winner in this year's Web Accessibility Challenge. The annual challenge is sponsored by NC State's IT Accessibility Office. BTEC has been named Overall Champion in NC State’s 2018 Web Accessibility Challenge for having 0% accessibility errors on its website. The goal of the annual challenge, in which 32 campus departments and student groups participated, is to make websites more accessible for individuals with disabilities. Each participant received an automated scan of their website that detailed accessibility errors found on the site. The IT Accessibility Office helped participants understand how to update their websites and re-ran the report on the final day of the challenge. Crystal Tenan, the Office of Information Technology’s accessibility coordinator, presented BTEC’s Brian Herring with certificates for earning the Overall Champion award and achieving a score of 0% of pages containing level A and level AA errors based on the Web Content Accessibility Guidelines 2.0. As BTEC’s instructional media developer, Herring is responsible for BTEC’s website design and serves as webmaster. See the final results for all of the categories at the NC State Web Accessibility Challenge Champions page.